We’re all familiar with the final product: A beautiful, bright exhibit rental booth that’s perfectly placed on soft carpet on the trade show floor. But how does the booth get assembled? What gets put together first? Having a timeline of what gets built when can help exhibitors and attendees better appreciate this major marketing tool. 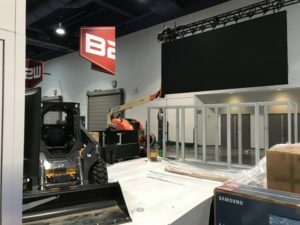 This first step in building an exhibit rental is making sure all your paper work, such as certificate of insurance, EAC, convention center permit, electrical plan and diagram of booth orientation are all completed and ready. Second, all your graphics should be submitted to the exhibit house in a timely manner to ensure their accuracy. 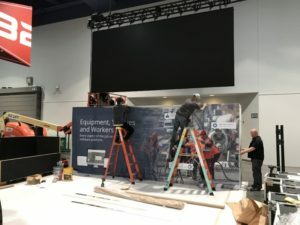 Now, there are two ways to move your booth to the trade show floor. The first is to send your exhibit to the show warehouse. 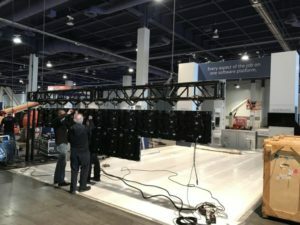 This will get your booth to the floor typically one day before the show is to be assembled. The next is to marshal your exhibit to the general contractor on the targeted move-in date. When it’s time to install, a crew will arrive and review that the electrical has been properly laid prior to putting the carpet and padding down. Then a floor plan of your booth orientation is reviewed. You’ll want to provide a floor plan of your booth in advance that indicates where your main entrances will be. This is done by writing the surrounding exhibit numbers around your booth and making sure your booth is facing a the correct way, adjacent to the main entrance. Next, padding and carpet are laid on the floor and taped off. And finally, booth construction will begin. Bematrix B62 frames are assembled with tools and connectors. 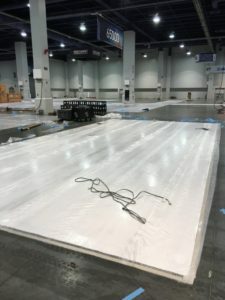 Your I & D (Install and Dismantle) team will then begin to skin your booth with Komatex, SEG fabric or another prearranged finish. After the booth is assembled and graphics have been put into position, any audio/visual rentals or added shelving will then be placed into position. Reception counters and furnishings will then be positioned also. Finally, after furniture and accessories have been placed, we do a once-over to make sure the booth is polished and that you are show ready. We even cover fine details, like ensuring there are trash cans in the booth, as well as cleaning all glass to remove any traces of fingerprints. We can also prearrange marketing materials to be taken to the warehouse and delivered directly to you on the trade show floor. During the show, we are always just one phone call away for any ser vices you might need! And finally, before packing up and heading home, make sure you’ve made contact with the trade show’s General Contractor and ensure that your billing information is upto-date. This final step is important because the show will not release any of your freight from the exhibit rental unless all invoices have been paid and cleared! In the event you have any outstanding invoices at the end of the show, your exhibit rental will end up in storage and you will be charged a daily storage fee!